An Amiga version is also known to exist. 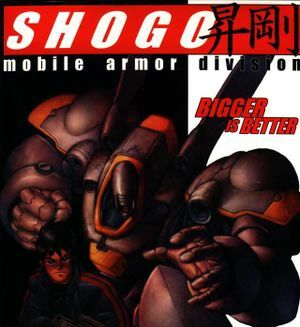 Shogo Patch 2.214 is recommended and does not require any previous patches to be installed (the GOG.com version already comes pre-patched). 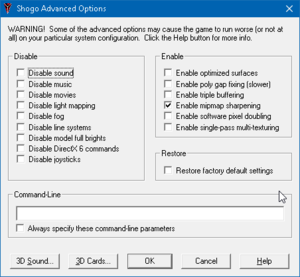 dgVoodoo stabilizes performance and is essential for getting Shogo to run on modern systems. FOV is Vert-. 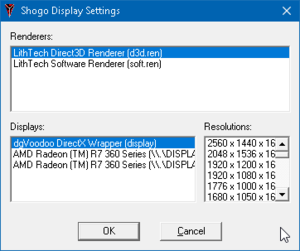 Use the widescreen patch to add in a proper FOV. Control panel hack doesn't seem to apply to all textures. Will need to use dgVoodoo. Might need to use dgVoodoo for stable performance. Menus can only be navigated with the arrow keys. Supports joysticks out of the box, but is very basic. For details on better native support, go to <path-to-game>\Joystick and open a file called joystick.htm. Has not been tested with GOG.com version. Can't navigate menus with joystick. See Controller Remap Notes for details. Must be configured in Joystick.cfg. Each axis, including the Right and Left Triggers on XInput controllers, can be individually given digital or analog actions, (i.e. RT = Fire, Y Axis Up = Jump, X Axis = Turning). See Controller Support Notes for details. Must be configured in the Joystick.cfg file. See Controller Support Notes for details. Any axis can be inverted. Must be configured in the Joystick.cfg file. See Controller Support Notes for details. 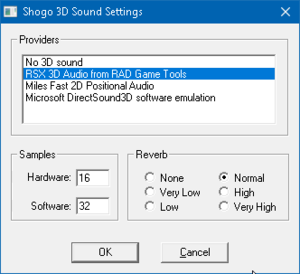 DirectSound3D, Miles Fast 2D Positional Audio, and RSX 3D Audio are included in the game. All dialogue has subtitles that cannot be turned off. Open AM18.DLL with a hex editor such as HxD. Find the text dslite.dll (when you find dslite.dll there should also be a dsound.dll somewhere nearby). ↑ 2.0 2.1 File/folder structure within this directory reflects the path(s) listed for Windows and/or Steam game data (use Wine regedit to access Windows registry paths). Games with Steam Cloud support may store data in ~/.steam/steam/userdata/<user-id>/610860/ in addition to or instead of this directory. The app ID (610860) may differ in some cases. Treat backslashes as forward slashes. See the glossary page for details.